A man and his best friend navigate snowy Veres Street on THursday morning. It looks like it's going to be one of those days. A winter storm that has dumped light, slippery snow on Fairfield -- about 3 inches by 10 a.m. -- and the rest of the region, is expected to add deeper accumulations, mixed with dangerous sleet, throughout the day and into early Friday. A winter storm warning remains in effect until 6 a.m. Friday, while coastal flooding is possible from 5 p.m. today through 1 a.m. Friday. 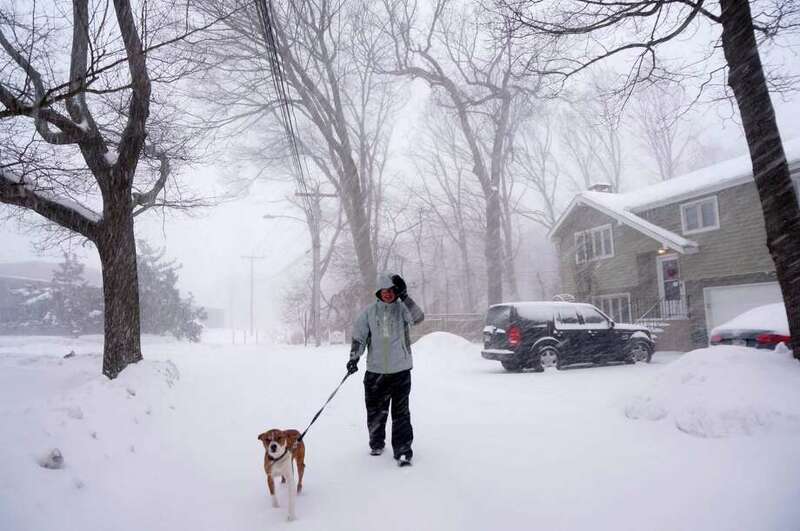 Fairfield's schools and their administrative offices, the town's municipal offices and the Fairfield Public Library branches were all closed Thursday. Metro-North Railraod and the region's buses were running on a reduced schedule. By mid-morning, however, Fairfield police reportred no serious accidents. The shift to a wintry mix is expected to take effect by late this morning, according to the National Weather Service. Snowfall today could be heavy at times. High near temperature near 34 degrees, with a north wind 18 to 22 mph. Total daytime snow and sleet accumulation of 5 to 9 inches is possible, the NWS says. Tonight, rain and sleet will continue before 10 p.m., then all snow is anticipated as the temperature charts a low of about 30 degrees. There will be a blustery north wind 15 to 21 mph, becoming northwest after midnight. New overnight snow and sleet accumulation of 2 to 4 inches is possible, according to the NWS. Friday should be mostly sunny as the storm remnants clear out and temperatures reach a high of about 40 degrees. By Friday night, there is a chance of snow after midnight, as temperatures fall to the low-20s. There is a chance of daytime snow again Saturday, the weather service predicts, then a slight chance of rain and snow mixed by afternoon. The high temperature will be in the upper-30s. The outlook for Sunday is mostly sunny, with a high temperature in the upper-20s.